Casio CW-K85 Disc Title Printer. Prints in 200dpi resolution and at 8mm per second on CDs and DVDs with a blank unlined surface. The Title Printer has a USB port for connection to your computer; an integrated computer-like keyboard for stand alone operation; and 5 pre-installed fonts. The print format for the CW-K85 consists of 18 alpha-numeric formats and four graphic formats that you can select from. The CW-K85 is a thermal printer with a print area measuring 5/8” x 2 15/16.” You can print up to 16 lines on a standard CD-R. 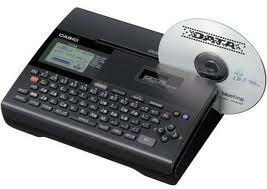 The disc title printer is powered by 8 “AA” size batteries or an AC adapter. Package includes AC adapter, black ink cartridge and USB cable.